The music video for "You May Be Right" was in heavy rotation in the early days of MTV in 1981. © 1980 Sony BMG Music Entertainment. Billy starts off Glass Houses with a rocker, "You May Be Right." The song opens with the sound of glass breaking, signaling that this album will be unlike his last. 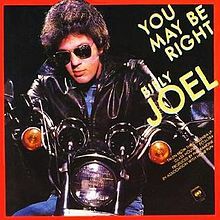 "You May Be Right" was also the first single off the album and surprised many with its rock sound, guitar riffs, and lack of piano. Billy is at his pugnacious best here, telling his listener that Billy may be crazy, but he just may be what the listener is looking for. It's a classic rock-and-roll theme, good girl falls for the "bad" guy. The bad guy may be uncouth, but his rough charms seem to be working ("I told you dirty jokes until you smiled"). This is not unlike the protagonist in "Only The Good Die Young." Here, Billy uses a Mick Jagger-like vocals to enhance the "bad" guy image of the song. It's a fun song, and listeners agreed, sending it to #7 on the charts. Rock songs like "You May Be Right" allowed Billy to get out from behind the piano and become a lead singer in front of the stand-up mike. He took advantage of this and recorded a series of music videos for the album, including ones for this song, "It's Still Rock and Roll to Me," "All for Leyna," and "Sometimes A Fantasy," helping to launch the nascent music video industry. His videos were frequently played on the new MTV television network and Casey Kasem's America's Top Ten. The song became a favorite of cover bands, and has a honky-tonk feel which makes it popular for country stars who are rocking out like Keith Urban and Garth Brooks, who both perform it live. Billy Joel discusses “You May Be Right” on SiriusXM. This is a fun live version of "You May Be Right" from 1982's concert video, Live from Long Island. A brief behind-the-scenes look at the recording of "You May Be Right" from the ABC News Magazine 20/20 in 1980.